Dallas Industries, Troy, MI, will demonstrate its unique ProfileSelect feed control and explain how it minimizes electrical and mechanical stress on stamping equipment and material. Unlike standard controls, ProfileSelect uses a sinusoidal profile (cam motion), providing a smooth motion and material feed and utilizing 100 percent of the press-feed window while putting less stress on all mechanics. Standard press controls use a trapezoidal profile, which results in quick, jerky motions that can slip, putting stress on the die and material and potentially damaging the part’s surface. ProfileSelect is ideally suited for progressive-die work when the part’s cosmetics are a factor or when using delicate material. 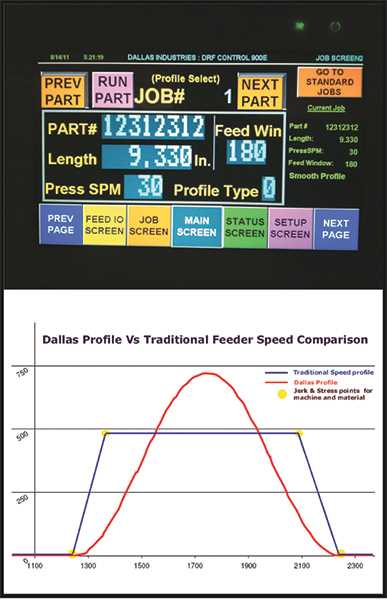 The controls have an HMI touchscreen and come standard on all new Dallas press-feeding equipment or can be retrofitted to most existing line. Also on display: a pair of state-of-the-art servo press feeds connected to a networking, monitoring and analysis system for communicating to the plant floor while monitoring and analyzing equipment efficiencies and providing reports.